Bond prices serve as a benchmark for many things, including interest rates, forecasts of future economic activity and future interest rates, and perhaps most importantly, they’re a smart component of a well managed and diversified investment portfolio. Understanding bond prices and yields can help any investor in any market, including equities. In this article we’ll cover the basics of bond prices, bond yields and how they’re affected by general economic conditions. The chart below is taken from Bloomberg.com. We will refer to information shown in this chart throughout the article. Note that Treasury bills, which mature in a year or less, are quoted differently from bonds. T-bills are quoted at a discount from face value, with the discount expressed as an annual rate based on a 360-day year. For example, you will get a 0.07*90/360=1.75% discount when you purchase the T-bill. A bond’s dollar price represents a percentage of the bond’s principal balance, otherwise known as par value. In its simplest form, a bond is a loan, and the principal balance, or par value, is the loan amount. So, if a bond is quoted at 99-29, and you were to buy a $100,000 two-year Treasury bond, you would pay $99,906.25. Let’s look at how we calculated this number. A bond’s price consists of a “handle” and “32nds”. The two-year Treasury’s handle is 99, and the 32nds are 29. We must convert those values into a percentage to determine the dollar amount we will pay for the bond. To do so, we first divide 29 by 32. This equals .90625. We then add that amount to 99 (the handle), which equals 99.90625. So, 99-29 equals 99.90625% of the par value of $100,000, which equals $99,906.25. The two-year Treasury is trading at a discount, which means that it is trading at less than its par value. If it were “trading at par”, its price would be 100. If it were trading at a premium, its price would be greater than 100. Before we discuss discount versus premium pricing, remember that when you buy a bond, you buy more than principal balance; you also buy coupon payments. Different types of bonds make coupon payments at different frequencies. Coupon payments are made in arrears. When you buy a bond, you are entitled to the percentage of a coupon payment due from the date that the trade settles until the next coupon payment date, and the previous owner of the bond is entitled to the percentage of that coupon payment from last coupon payment date to the trade settlement date. Because you will be the holder of record when the actual coupon payment is made and will receive the full coupon payment, you must pay the previous owner his or her percentage of that coupon payment at the time of trade settlement. In other words, the actual trade settlement amount will consist of the purchase price plus accrued interest. When would someone pay more than a bond’s par value? The answer is simple: when the coupon rate on the bond is higher than current market interest rates. In other words, the investor will receive interest payments from a premium priced bond that are greater than what they could earn in the current market environment. The same holds true for bonds priced at a discount; they are priced at a discount because the coupon rate on the bond is below current market rates. A yield relates a bond’s dollar price to its cash flows. A bond’s cash flows consist of coupon payments and return of principal. Principal is usually returned at the end of a bond’s term, known as its maturity date. A bond’s yield is the discount rate that can be used to make the present value of all of the bond’s cash flows equal to its price. In other words, a bond’s price is the sum of the present value of each cash flow. Each cash flow is present valued using the same discount factor. This discount factor is the yield. Intuitively, discount and premium pricing makes sense. Because the coupon payments on a bond priced at a discount are smaller than on a bond priced at a premium, if we use the same discount rate to price each bond, the bond with the smaller coupon payments will have a smaller present value (lower price). In reality, there are several different yield calculations for different kinds of bonds. For example, calculating the yield on a callable bond is difficult because the date at which the bond might be called (the coupon payments go away at that point) is unknown. However, for non-callable bonds such as U.S. Treasury bonds, the yield calculation used is a yield to maturity. In other words, the exact maturity date is known and the yield can be calculated with certainty (almost). But even yield to maturity has its flaws. A yield to maturity calculation assumes that all the coupon payments are reinvested at the yield to maturity rate, although this is highly unlikely because future rates can’t be predicted. A bond’s yield is the discount rate (or factor) that equates the bond’s cash flows to its current dollar price. So what is the appropriate discount rate or conversely, what is the appropriate price? When inflation expectations rise, interest rates rise, so the discount rate used to calculate the bond’s price increases, making the bond’s price drop. It’s that simple. The opposite scenario would be true when inflation expectations fall. We’ve established that inflation expectation is the primary variable that influences the discount rate investors use to calculate a bond’s price, but you’ll notice in Figure 1 that each Treasury bond has a different yield and that the longer the maturity of the bond, the higher the yield. This is because the longer a bond’s term to maturity, the greater the risk that there could be future increases in inflation and the larger the current discount rate that is required/used by investors to calculate the bond’s price will be. By this time, you should recognize this higher discount rate as being a higher yield. The credit quality (the likelihood that a bond’s issuer will default) is also considered when determining the appropriate discount rate (yield); the lower the credit quality, the higher the yield and the lower the price. Inflation is a bond’s worst enemy. When inflation expectations rise, interest rates rise, bond yields rise and bond prices fall. To that end, bond prices/yields, or the prices/yields of bonds with different maturities are an excellent predictor of future economic activity. To see the market’s prediction of future economic activity, all you have to do is look at the yield curve. The yield curve in Figure 1 predicts a slight economic slow down and slight drop in interest rates between months six and 24. After month 24, the yield curve is telling us that the economy should grow at a more normal pace. Understanding bond yields is a key to understanding expected future economic activity and interest rates, which is important in everything from stock selection to deciding when to refinance a mortgage. 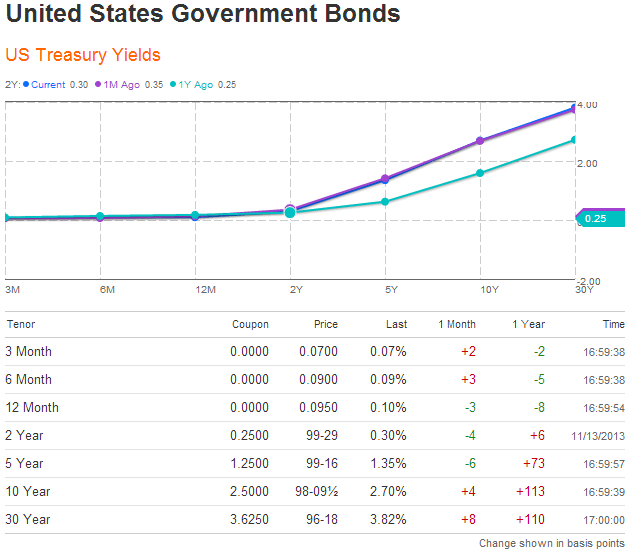 Use the yield curve as an indication of potential economic conditions to come.